Although the format has moved on from analogue four-track cassette tape to digital multitrack stored on SD card, the Portastudio paradigm originally set by the TEAC 144 in 1978 hasn’t changed all that much over the last 40 years. Even today, Tascam’s digital Portastudios (and similar products from Boss and Zoom) still utilise the fader-based, multichannel layout pioneered by the 144. However, advancing technology takes no prisoners and, as the user interfaces that link us to physical technology continue their evolutionary pathway from direct hardware control through wireless touchscreens to whatever lies beyond, it was only a matter of time before the classic Portastudio concept was reimagined for the home-based recording musicians of today. Enter iZotope, a US company perhaps best known for their range of audio plug-ins for music and post-production environments, and whose latest products exploit both artificial intelligence and machine learning in order to help enhance recording, mixing and mastering workflows. 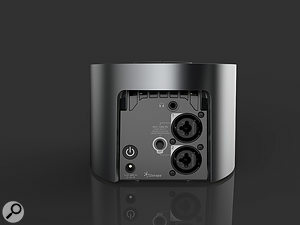 iZotope’s co-founder and CEO Mark Ethier’s desire to be able to record immediately led to a multi-year development program that culminated in the Spire Studio, a compact, portable eight-track digital recording system that is record-ready at power-up. With a truncated, black, slightly slope-sided cylindrical form that is little larger than my favourite tea mug, the Spire Studio looks like no current or previous member of the Portastudio genus — no faders, no knobs, nothing you’d recognise from the past. Only the top surface’s segmented, touch-sensitive, multi-colour LED ring, a built-in microphone grille, the central, semi-circular Record and Play buttons and the three smaller switches sitting on its circumference with legends denoting New Song, Soundcheck and Headphone Volume, hint at what might lurk inside. 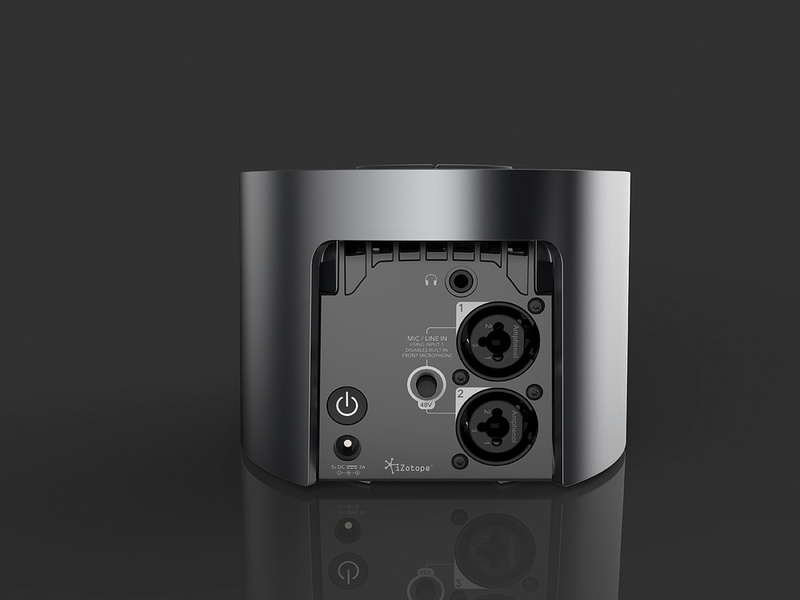 The Spire Studio’s back panel is very simple, with just a pair of combi jack/XLR connectors, a headphone socket and buttons for power and 48V phantom power.A squared-off recess at the back of the unit carries two XLR/TRS combination connectors, a 48V phantom power switch and a 3.5mm headphone jack (duplicated at the front), plus the connector for the included external 5V DC power supply that not only powers the Spire, but also recharges its internal battery to give you four hours of continuous use from a full charge. Despite its minimalist appearance, this seemingly simple setup enables you to record, replay and monitor (but not balance) a maximum of eight individual tracks at 48kHz/24-bit resolution. You can also adjust headphone volume, and mute, unmute and delete tracks without requiring any additional hardware or software. Underneath the Spire’s surface serenity there is a lot of paddling going on. A custom-designed omnidirectional condenser microphone sits behind the integral grille and is angled upwards on the assumption that the Spire will normally be positioned lower down in front of the vocalist or acoustic musician on a low table or similar support. For more complex mic setups, the two rear-panel combi connectors feed preamps developed by Grace Designs. The built-in microphone is disabled when a mic or instrument is connected either to input 1 only, or to both rear-panel inputs simultaneously. When only input 2 is in use, the internal microphone remains active. Pressing the Soundcheck button initiates an automatic setup function that simply requires you to play and/or sing into the Spire — either directly and/or via any connected external sources — until the process completes. You can monitor its progress via an incremental illumination of the LED ring. Soundcheck not only sets the optimum gain level for each input but also activates the onboard intelligent digital signal processing (DSP) that aims to correct and enhance your recordings by reducing noise, clipping, room reverb and other unwanted artifacts in order to make them sound more ‘produced’. If you’re familiar with iZotope’s Neutron program you’ll know just how effective that company’s proprietary DSP correction and enhancement can be and, if you’re not, a visit to www.izotope.com will enlighten you. Alongside its DSP correction capability, the Spire Studio also carries a small selection of Recording Effects that are only available individually and which have to be recorded as part of a track. An integral 2.4GHz Wi-Fi hotspot allows the connection of a compatible iOS device as a touchscreen-based wireless remote control. 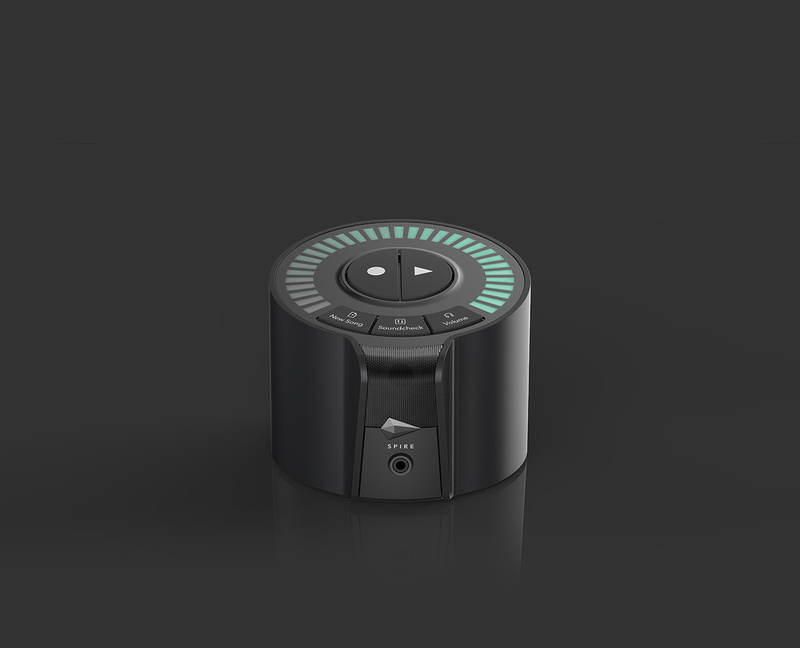 This remote control interface for the Spire Studio comes in the shape of version 2 of the stand-alone, iOS-only Spire Music Recorder app. Although the Apple iTunes store listing implies that the current 2.6.1 version of the app — which requires iOS 10 and above — is compatible with the iPhone 5S, that compatibility actually ended at version 1.1.14, which means that you’ll need either an iPod Touch, iPhone 6, iPad Air, or iPad Mini 2 (or their later versions) in order to gain remote control of the Spire Studio. 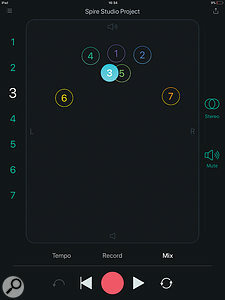 The Spire Music Recorder was first released in August 2015 as a handy little four-track iOS recording app that featured iZotope’s DSP audio enhancement (limiter, de-esser, dynamic EQ and stereo imager); touch-and-drag mic input level adjustment and stereo mixdown; hands-free voice control of record start (a feature that has yet to cope reliably with my mongrel Scottish accent); a metronome; and the ability to share to other apps, cloud storage, email and messaging services. The v2 Spire Music Recorder update not only added four additional tracks, but also updated the app to turn any compatible iOS touchscreen device running it into a wireless remote control for all the Spire Studio’s functionality when connected to that unit’s integral Wi-Fi network. Using the Spire Studio in stand-alone mode is simply a matter of powering it up, plugging in a pair of headphones, pressing the New Song button (which creates a new Spire Studio Project), pressing Soundcheck and playing and/or singing until that process completes and, finally, pressing the Record button. Once you press stop, the next track is ready to record and, should you wish to, you can carry on — repeating the Soundcheck process when necessary — until all eight tracks are used up. To record two sources simultaneously, plugging into both rear inputs simultaneously (or leaving the internal mic active by plugging into input 2) will ready two tracks for recording. Drawbacks that you need to bear in mind when running the Spire Studio stand-alone is that there is no way to manually adjust the input level of the track you’re recording and that there is no facility to create a level-balanced cue or master mix. However, add remote control via the Spire Music Recorder iOS app and both these issues vanish instantaneously. Launching the app brings up its home screen, from which you can connect to the Spire Studio and its onboard Wi-Fi. Once connected, the app enables you either to create a new project, to load an already recorded project, or to import or download an audio file from your device or from any other sources that it can reach — iCloud, Dropbox, OneDrive, etc. Once downloaded, the file is converted into the Spire format and uploaded to the Spire Studio to create a new Project. 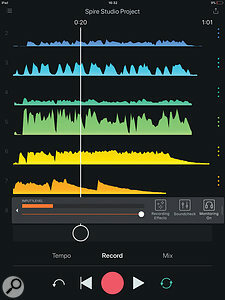 The recording screen in the Spire app. When using the app, the basic recording process is only slightly more complex than when running stand-alone: connect your source(s), open the Record screen, run the Soundcheck procedure (from either the app or the Spire Studio) and you’re ready to record. If you wish, you can manually adjust the track input level and also add a single recording effect to the track(s) that you are ready to record, and audition the result before you start recording. The available effects include three amplifier emulations (Verb ’65, Tube 30, Bass), an Acoustic Shaper for guitars of that variety, two reverb sounds (Warm Voice and Deep Space Vibes) and two delays (Intimate Space Vibes and a Vintage Dub Echo). Usefully, both delay times are linked to the tempo of the onboard metronome. On-screen controls enable you to modify the Amount and Tone of the two Vibes and the Dub Echo, the Character and Amount of the Warm Voice, and the Shine and Shape of the Acoustic Shaper. The amplifier emulations are more comprehensively equipped, the Reverb ’65 and Tube 30 having Tone, Tremolo, Tremolo Depth and a Bright switch in common, with the former (as you’d expect) sporting a Reverb level control and the latter featuring Drive level instead. The Bass amp’s five controls are Tone, Presence, Drive and Blend, topped off by a Boost switch, the combination giving you access to more overdriven guitar sounds. Recorded tracks are displayed on the Record screen as fairly rudimentary waveforms, the colour of each track corresponding to the Spire Studio’s hardware LED track display. Track editing controls that are available on the Record screen are Mute, Delete and Trim, which allows you to delete unwanted areas at the beginning and/or end of a track to clean up your tracks before proceeding to mix them down to stereo. To assist you in auditioning and setting a trim point, touching the on-screen playhead for a second or so brings up a zoom mode with a one-second audio loop. The Mixer page lets you adjust each track’s level and pan.The Spire Studio’s Mix screen, rather than having faders, displays a graphical representation of a stereo soundfield populated by numbered circles, each corresponding to a recorded track. Moving a circle upwards in the soundfield increases its volume and moving it to the left or right pans it. The only other controls available in Mix mode are the per-track Mute and Mono/Stereo ‘switches’. Once you’ve created your mix, you can email or save it straight from the Mix screen in m4a or wav formats, and upload it directly from the app to social media or SoundCloud if you so wish. If you want to have more control over your mix, individual tracks can be exported and saved for import into your DAW. An entire Spire project can also be exported for sharing with other Spire Studio users, and for backup purposes. Another point to note is that projects recorded on your Spire Studio are saved to your iOS device when opened in the app over Wi-Fi, so that you can work on them ‘offline’. Depending on the amount of memory available in your iOS device, you may have to actively manage the number of projects stored on it. Opening a recording made on your device when connected to the Spire Studio automatically exports it to form a new project. 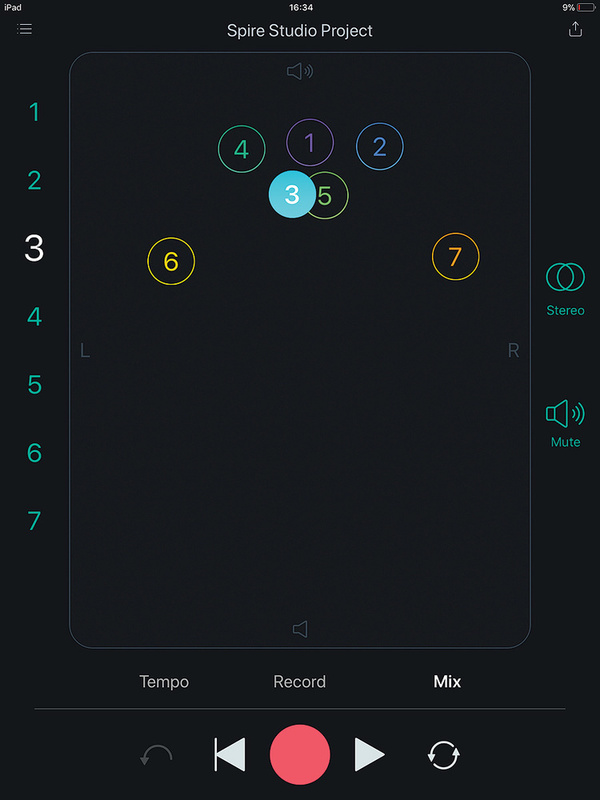 Although the original operational paradigm survives pretty much unchanged, the app-based control surface of the Spire Studio represents a significant step away from the traditional Portastudio form factor at a relatively attractive price for what’s on offer — provided that you already own a compatible iOS device. By combining a touchscreen interface with their own proprietary DSP software, iZotope have come up with a digital audio recorder that, to my mind, is true to the original Portastudio concept of a simple-to-operate multitrack recorder that enabled musicians to capture moments of inspiration, to create demo tapes and even, in the shape of Bruce Springsteen’s Nebraska, to record a commercial album release. The fact that the Spire Studio and its associated app have the potential to do all that and more at a very high performance level without requiring any external microphones or hardware (other than a pair of headphones), shows just how much the technology of audio recording (and our relationship to it) has advanced over the last 40 years. 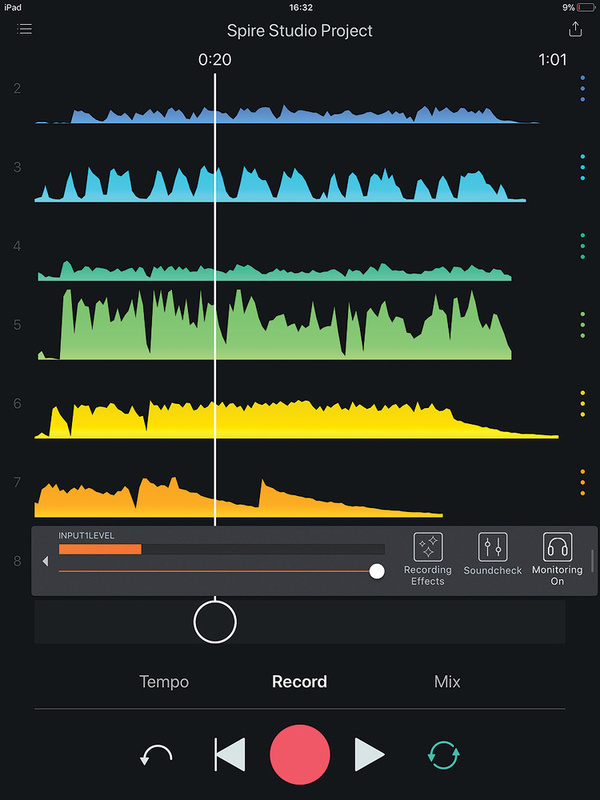 If you’re looking for a portable, quick and easy to use digital multitrack recorder, or if, like me, you already own a compatible iPhone/iPad that you’re using as a musical notebook, then you should take a very close look at iZotope’s Spire Studio. I can’t see me wanting to send this one back. Excellent results from the integral microphone. Soundcheck feature and iZotope DSP ensures optimum results. Rechargeable internal battery gives true portability. To make investing in a Spire Studio an attractive prospect, you’ll need to already own a compatible iOS device. An ingenious update of the original Portastudio concept that offers musicians the opportunity to produce high-quality multitrack recordings in a compact, portable, easy-to-operate package.